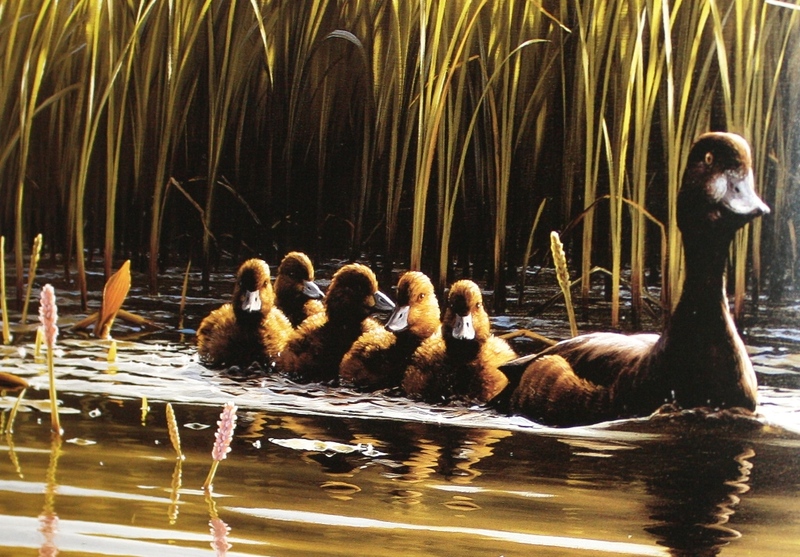 It was on 22 March 2014 that I last featured an exhibition by the superb wildlife artist Carol Barrett on this blog. The artist has another exhibition of her paintings at Waterston House in Aberlady, home of the Scottish Ornithologists’ Club, of which I am a member although I’m not a practising birder. Just as the Inuit People don’t like to be called Eskimos, so birders don’t like to be called twitchers. This new exhibition – only on until 5th April – a few days hence – is one we’ve been meaning to visit for ages but it was certainly worth the effort. While the last exhibition concentrated fully on Carol Barrett’s stunning paintings of African wildlife, especially the magnificent elephants, the current exhibition has an Australian section. The African part of the exhibition contains intensely detailed portraits of elephants, lions, hyenas and cheetahs. It is the detail e.g. of the lion or cheetah’s whiskers that is so impressive and Carol Barrett’s paintings do present these graceful but powerful animals very well. In the Australian part of the exhibition, there are beautiful portrayals of birds – rosellas, cockatoos and kookaburras – as well as animals such as koalas. This section brought back memories of our 3 year stay in Australia in the 2000s. Before going to work for Charles Sturt University, I was told that I would see what were referred to as budgies and parrots flying around. I thought I was being teased but in fact, you do see budgies/parakeets and many different kinds of parrots in towns and in the countryside. As an aside, the term budgies is also Australian slang for men’s tight fitting swimming trunks or speedos. I emailed Carol Barrett and she kindly sent me two samples from the exhibition. 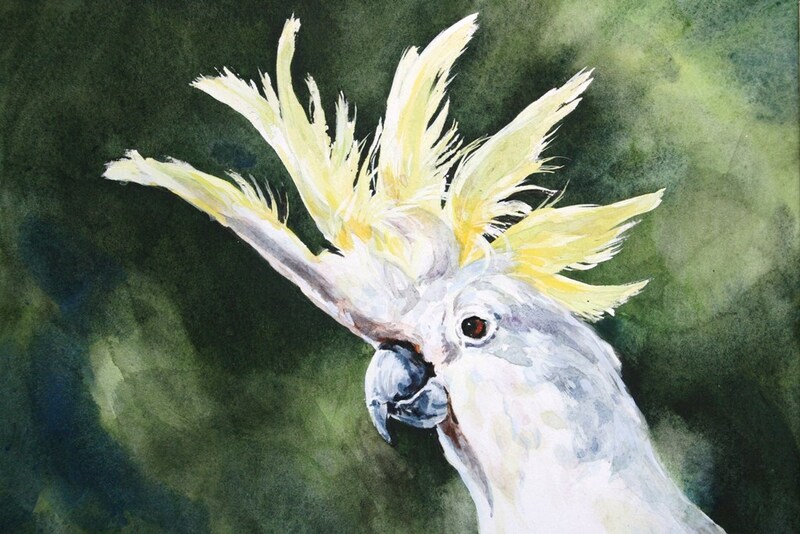 The first is of a sulphur crested cockatoo. This is a fine image and captures the bird’s rather haughty look, its punk hairstyle, its vicious beak and alert brown eye. This is a cockatoo at peace with the world. These birds often sound as if they are at war with the world. The first time I heard these birds was when, not long after arriving in Wagga Wagga to live, I was out cycling in the countryside. I passed a large tree but did not see the birds in it. The next thing I knew was that there was a hellish screeching just behind me and then in front of me as a group of cockatoos screamed past me. I really did get a fright. If you went down to the Murrumbidgee River (good photos) in Wagga Wagga at dusk, hundreds of cockatoos came to roost and there was a great cacophony of noise at the water’s edge. 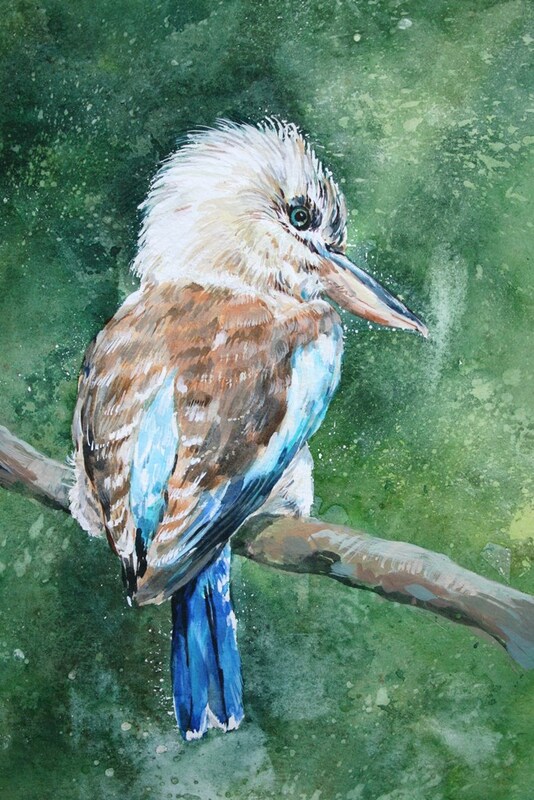 The second painting is of a blue winged kookaburra. This bird is a bit smaller than the better known laughing kookaburra which we saw quite often in the woods around Wagga Wagga. The colours in this painting are delicately presented and I like the way the different shades of blue flow down the beak, body and tail of the bird. This looks like a well manicured bird, with its head feathers blow dried and swept back. 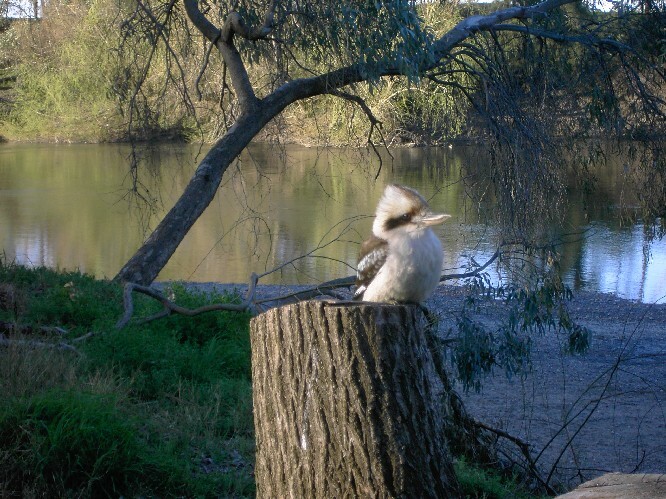 When we saw the laughing kookaburras, there was sometimes a family sitting on a tree branch. This bird of course is known for its “laughing” call and we’d sometimes hear them calling out their merry cry at the edge of the Murrumbidgee. You can see the bird and hear its call here. To complement Carol Barrett’s depiction of a kookaburra, I’m adding 2 photos of my own. 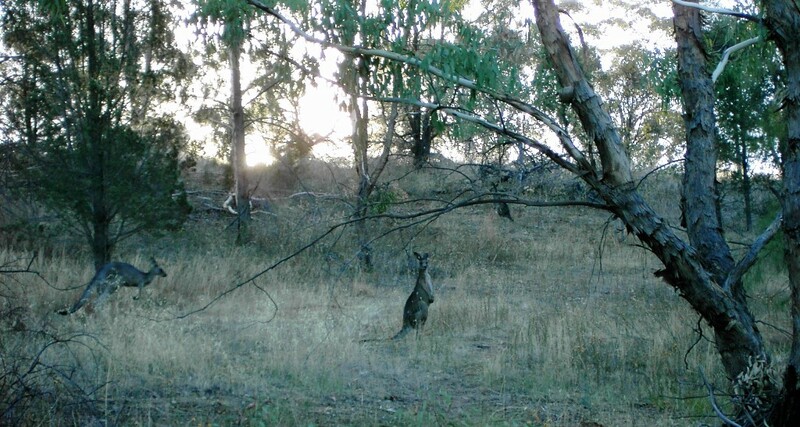 the first was taken in large park during a visit to friends in the outer Western suburbs of Sydney. 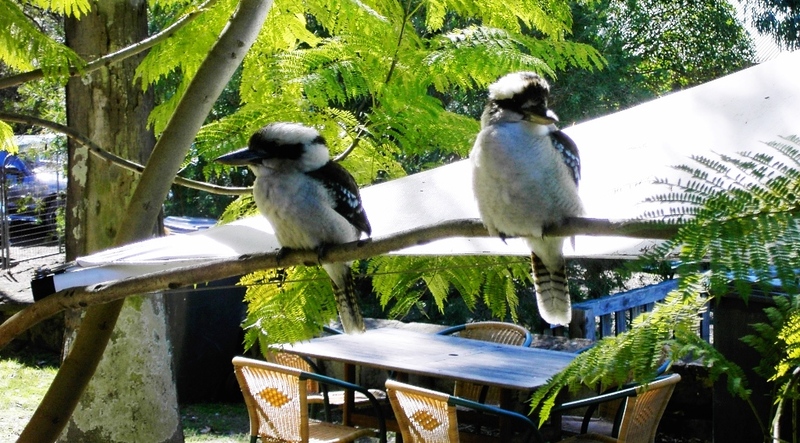 These two kookaburras were quite nonchalant about my approach and my camera clicking. 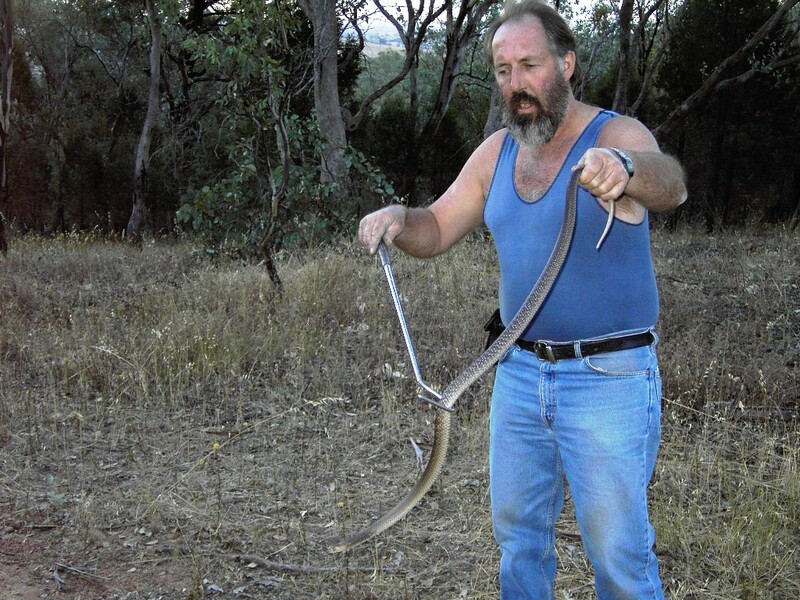 They have superb, symmetrically patterned tails and large, protruding beaks. Considering the raucousness of their laughing call, kookaburras appear the calmest of birds. The second was taken at Wagga Beach (good photos). Now, many of you will know that Wagga Wagga is 283 miles (455K) from Sydney but there is a sign on the way to the Murrumbidgee River in Wagga Wagga saying Wagga Beach – a little local joke. There is some sand at this point on the river’s edge and many people go swimming in the river in the summer time, so maybe it can be classified as beach – just an inland one. A visit last week from friends whom we met in Australia many years ago. I worked with my former colleague, now Professor Anne Lloyd of the University of Boras (pr Boroos) at Charles Sturt University in Wagga Wagga, where her husband Jim Zantiotis works as an educational psychologist in local schools. We took Anne and Jim to nearby Hailes Castle (good photos) to give them a flavour of historic East Lothian. The castle is not as well-known as other castles in the county such as Tantallon Castle (many photos) and nestles in a dip in a narrow country road, where I often go cycling. Depending on the time of year, you can have the place to yourself. We went on a Sunday morning and a few people followed us in. At first, the castle looks restricted in size as you enter the gate and cross the wee, gurgling burn but when you get to the entrance, you see that the castle extends greatly to your left and right. You can see a possible reconstruction of the castle here. There is a wide range and age of stonework in the castle which was originally built in the 13th century, and as you can see from the photo above, the more modern finished red sandstone sits beside the original rough stonework used to build the castle. The castle has a long history and the Hepburn family, one of the greatest landowners in Scotland, occupied the castle for long periods and there is speculation that Mary Queen of Scots may have stayed there briefly. As you walk around the castle, you come across the pit prison (photo) which went into a deep dungeon and you get the feeling that if you were put down there, you might never see the light of day again. One of the main parts of the living quarters of the castle was later turned into a doocot (photo). The castle sits by the river Tyne and if you walk round the back of the castle – see photos below – you get a peaceful feeling and a great view up to the castle walls and along the river. If you are visiting East Lothian, put this castle on your list – just don’t tell anyone. North wall of Hailes Castle. View along the River Tyne from Hailes Castle. I wasn’t going to put any more photos of tulips on the blog this year, in case readers might get tulip fatigue but taking our friends to North Berwick Gardens we came across 2 vibrant displays which the local municipal gardeners had planted. The combination of the tulips and wallflower was not too harsh, despite the bright colours – see photos below. I took a close up of one of the tulip heads and it could be an example of Japanese art.